There was more interest in Plaxico Burress, who spent the last 18 months catching mail bags in a prison laundry room, than there was in Randy Moss, who actually caught NFL passes last year? 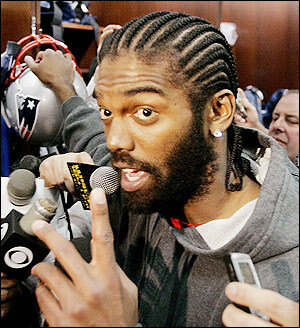 As a Patriots fan, it was fun to watch Moss streaking down the field, and as a fan of comedy it was even more fun to watch every time he opened his mouth. But he retires as goods so damaged, that a guy who shot himself in the leg is more attractive. Randy Moss will probably end up in the Hall of Fame, but his story, and his legacy, will be a cautionary tale.